The Woo Hoos: I survived week one of being back on the plan. I tracked my food intake and calculated points fairly faithfully. Careful with my portion sizes. Mostly made better choices. Go me. Along with eating more fruit, leaner proteins and veggies I tried a new cereal that was a hit. Mixing it with vanilla yogurt and fruit makes it like a parfait (except not as pretty just dumped in my bowl). 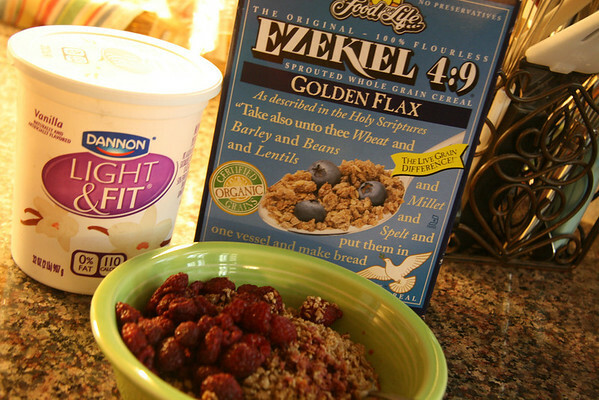 The Ezekiel 4.9 cereal is high in protein, lowish in fat and does not have all those icky preservatives. It was a bit pricier, of course since it's better for you. Grrr. More salads have been on my menu too. Love them. 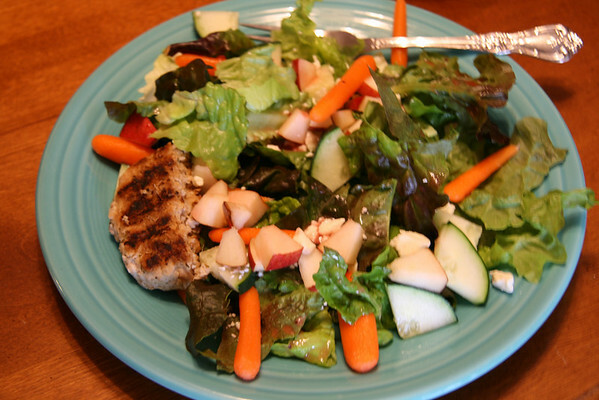 This one had pears along with salad veggies and a sprinkle of low fat feta cheese. Sometimes I'll top them with tuna (love those single serving pouches) or chicken, I had half a turkey burger patty with this one. Replaced junky treats with Fiber One yogurts and bars, sugar-free pudding, 100 calorie packs , 94% fat free microwave Kettle corn and Skinny Cow treats. Of course even with these moderation is the key. The So-Sos: Only ran once during the week. Still nibbled on chocolate. The Blatant Uh-Ohs: Ate chicken fajitas with all the trimmings (hello, what's the point otherwise?) on Saturday afternoon. Ate coffee ice cream with Heath bits at Marble Slab Thursday night (head hung in shame, BUT...it was GOOD). The result: I only lost 1.4 pounds this week. I am trying to be okay with this, based on the above confessions, and the fact that I know losing weight the best way will take time. Pause for deep cleansing breath. Goals for next week: Get more exercise in, at least 4x, hopefully more. Stay on track even with all the upcoming Easter celebratory eating. Try not to raid A. 's Easter basket. we love ezekiel cereal, especially the almond one loaded w/ fruit! That salad looks seriously so yummy!! ditto what Laurie said - that salad looks yummy! Yes, the Easter candy is scary. Fortunately for me with braces now I can't eat most of it anyway. But the stuff I can....watch out. The salad looks delicious! Go Holly! You're doing great! I really, really need to start something like WW too. I tried on my summer t-shirts the other day...ugh! way to go! slow and steady is the best way! you're doing great!